When industrialist E.L. McKee opened the High Hampton Inn in 1922 as a rural getaway in Cashiers, a menu of classics emerged to satisfy the crowds. The fluffy and lemony Sunny Silver pie became a favorite of his wife, Gertrude Dills McKee, North Carolina’s first female senator. 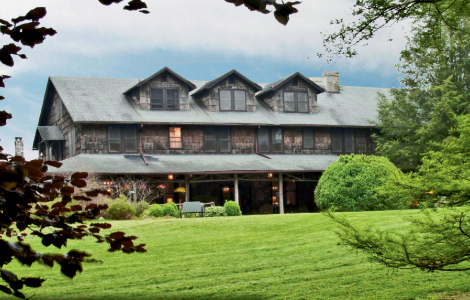 Over the past 90 years, the luxury inn has maintained it’s rustic charm and even some of the original recipes, including Gertrude’s favorite dessert. It’s been served every Sunday since the days when the prominent couple entertained legislators, friends, and family. The pie, with its light custard filling and lip-puckering tartness, is part of High Hampton Inn’s coveted recipe collection, much of which dates to the inn’s opening. It was featured in Favorite Recipes from Famous People, written in 1950 by Gertrude’s sister, Minnie Dills Gray. The cookbook was dedicated in Gertrude’s memory. In 1970, Lily Byrd McKee published the recipe in her cookbook, High Hampton Hospitality. Today, the McKees’ grandson, Will, oversees the property, keeping its rich history alive with the help of Executive Chef Sean Ruddy. “I try to make recipes from the inn’s cookbook and refer to it almost daily,” says Ruddy. As for the inn’s other classics, Ruddy proudly serves the Brunswick stew and potato pancakes. But, the Sunny Silver pie remains a staple for guests seeking a taste of history.